The scene, always the same, just a different number on a calendar to mark the days. Was it obligation or love that compelled me to spend my nights in that hospital room? Regret and disdain had long since been replaced with pity and a sort of obligatory love for a man who was more of a sperm donor than a father; but he was my father. His name was Victor . . . and he was dying. Thirty nine years seems a lifetime ago but in my quiet moments of reflection I sometimes ponder that question. Maybe the answer can be found by answering a different question: What is a father? I would suspect that there are as many answers as there are people who ponder that question; each conclusion reached by a view through the window of their own experience. My own conclusion would be skewed by misconception if not for one most important interruption. I became a Christian, and in so doing I found the perfect Father—God—the one who created me. Let me digress to an explanation of my own childhood. I, the youngest of four children, spent the early years of my life living in a four room shack on a barren piece of dirt in the middle of nowhere with no running water and an outhouse serving as the family bathroom. I longed for the love of a father who had none to give, either to his children or his wife. The discipline of a razor strap strategically placed, the slap of a hand at the back of my head, words spoken in anger without explanation, these became my memory and understanding of a man who took up residence in my life with no credentials of love to prove his title: Father. Would it have been better if he were missing in action—not there at all? Maybe. But his lack of desire for physical and emotional connection to his family deepened the black hole in my heart with each passing year until my disdain for him reached a point of permanent status. I smile as I look back on those early years of my childhood and marvel at a God who can take a stony heart like mine and fill it with love for a man named Victor—my Father. I held him tight the day he died in that hospital room so many years ago and I cried, not for me but for him, and all the regrets he could not replace. His time was up. Time would not let me forget the lesson taught that day—no regrets—two words to define a life, my life. And as I love my wife, my children and my grandchildren, the answer to that question from so long ago can only be love. It was my love for a Father who didn’t deserve it because of a God who loved me when I didn’t deserve it. If on this Father’s Day you find yourself where I was so many years ago, take heart, there is hope beyond the moment. God is the Father to the Fatherless—He wants to be your Father. It’s 8 AM and I’m sitting at Bagels by the Sea. The Saturday crowd is filling up the place and I’m at my favorite table. On the corner of Holladay and A Street, that’s where it sits, right downtown—best bagels ever. It’s February and basketball tournaments are in full swing. The place is alive with kids, and parents, and old people, and babies, and . . . . well, you get the picture. Add in the canned music, the espresso machine, the blenders, the voices, the laughter, then mix it all together and you have a potpourri of ambient noise that sets the tone for what I do here every Saturday. This is where I write my stories. And I’m not the only one chillin’, doing stuff. I Phones, and I Pads, and laptops, and paperbacks, and Nooks and Kindles, and newspapers. Oh, and don’t forget Seattle’s Best, and lattes, and espresso, and of course bagels of every kind. And they make the best sandwiches and granola—and it’s all served up with a smile. And to kill time while you’re waiting, answer the trivia question of the day and win a buck. If you haven’t figured it out yet, I hang out here—a lot. 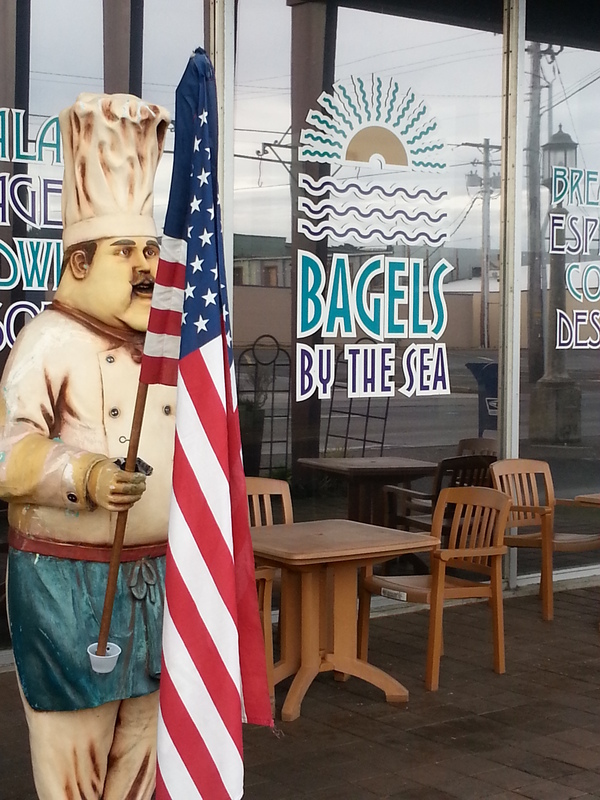 So next time you’re in Seaside drop in, say Hi to Denise, and Randy, and Jarrod, and the whole crew for that matter. See if you don’t agree that this is a fun place to hang out. I love where I live and I love to write. Inspired by my Mother’s declining mental health, I penned this letter in hopes I was not too late for her to comprehend my deepest thoughts of her. I dedicate this expression of love to all the sons and daughters who share my passion for the one who gave them life. I lost my Mother in November of 2010. Today is her birthday; she would be 93. As I write this letter—long overdue—I smile. Memories, like photographs in an old family album, flash in then out of focus, one by one, too many to count. All my thoughts are of you. For 60 years you have loved me; without conditions you have loved me. Words lack substance to describe my heart, filled beyond containment with gratitude for who I am because of you. In your quiet humble way you have taught me how to be a man. These eight words define your life; you are the sum total of all their meaning. Perseverance: No matter what life brought your way you made the best of it. You have never given up. God has blessed you in your striving. Humility: You put God first; ever trusting, never doubting, always expecting beauty from ashes that only He can bring. Joy: That smile to light up a room, that glow of contentment from somewhere deep—that is you, always you. Godly faith: This is knitted deep into your soul, a commitment not of words, but of living in the moment, every moment. On your knees, in your room, your quiet prayers for a wayward son, to a God of love; I listened through the door; I am that son, I remember. Strength: Not by choice but by circumstance you became the Mother, the Father, the sole provider in a family void of a man who cared enough to be a Father. But you loved him anyway, with a God love, far beyond my understanding. Generosity: Mom, out of your need you gave, willingly, always without reservation—first to God, then to your children, then to others—you gave your resources, your time, your life. Love: True love is selfless love—a Mother’s love, a Wife’s love—it describes you perfectly. Yours was a love to a husband who didn’t deserve it and to children who took it for granted. But you gave it anyway—and you give it—freely and without limit. May I strive to love my wife and children—and you—with that kind of love. Optimism: To you the glass appears half full—always—never half empty. And things must have looked different through those ‘rose colored glasses’ when you looked at me. You have a way of seeing the world the way it should be instead of the way it is, and lemons can be lemonade if squeezed into a pitcher of sugar and water, mixed with love. Time has grown me from a child into a man and I know you are proud of who I have become. But what I have invested into your life pales in comparison to what you have invested into mine. You gave me life, but more than that—you taught me how to live it. I am forever grateful. My words are few; my thoughts go deep. Mom, your life has touched so many. Your four children, (I, being the youngest) owe you much—for which you expect nothing in return. Please, know that you are loved—beyond measure you are loved. Just as King Solomon describes the woman of Proverbs 31, you are that woman. A time will come—too soon to be considered—when my hold on you will be released into the hands of He who made us, all of us. On that day God will smile with these words, “Well done my good and faithful servant.” With tears I will remember, and know I have not lost you; I will see you again. You are my Mom, but most of all you are my lifelong friend. You’re in my heart and in my soul, never to be forgotten. 2014—looks to be an interesting year. That being said, I am reminded of a joke. This guy falls off a cliff and on his way to sudden death he grabs onto the snag of a dead tree rooted in the rocky face. Saved for the moment but knowing it will only delay the inevitable, he looks up to the sky and cries out for help only to hear from none other than God Himself. “Oh God, please help me!” The man says. A rock breaks loose and plummets to the valley floor below; the snag shifts in his hand. Too often I am that guy. If life is measured in inches then the 18 inches from my head to my heart is the hardest journey for ‘my faith’ to travel. Simply put, the transformation of head knowledge to heart conviction is the most difficult journey of all. Wouldn’t it be great if every morning at 8 o’clock sharp, over a cup of coffee and a cream cheese smothered bagel, God would sit across the table from me with His perfect unalterable plan for my day?—maybe even my life. Okay, so that isn’t going to happen. I’m not even sure God likes bagels—or coffee. Why is it that in this very moment, after 40 years of walking with Jesus, I still find myself in a fetal state of doubting God? Maybe I live too much in ‘the moment’—in this life—with a limited glimpse of eternity. Maybe outside ‘the moment’, above the smog of circumstance that blurs the vision of my faith, maybe in that place of clarity I can find the sense of strength to fulfill my life’s verse: “To have faith is to be sure of the things we hope for, to be certain of the things we cannot see.” Hebrews 11:1 GNT. In this year of 2014 I will reach deep within myself to rise above ‘the moment’ with a commitment to faith that only God can give. In the beauty and mystery of human existence, may each of us strive in anticipation of God’s perfect plan for our lives. This was my last years Christmas Story for Christmas Eve to my Grandchildren. I’m working on this years story now! But Nicole and her brother thought they’d stay up instead. They both jumped to their feet at the sounds that they heard. Then they turned to each other with a look that asked, why? Wasn’t Santa supposed to show up on his sled? So, what’s with the trumpet and the bright star instead? Alexis rolled over in bed with the covers pulled high. With dreams about Christmas still fresh in their heads. It was Alexis who spoke, but they all understood. Maybe it was an angel in the midst of the blur. Cadence knew it was Christmas. So why couldn’t it be? Was proof that all five of them thought there was more. The place seemed so different; there was hay on the ground. Against the wall of the stable was a two handled plow. The cars and the parking lot, where did they go? The stable was there, but where was the snow? But they weren’t alone, there were eleven in all. Knelt at the manger without making a sound. While a world lost in darkness quietly wept. Was it Joseph and Mary with Him in that stall? If it was, did they know he would die for us all? That the story of Christmas had to be true. But it was Jesus who came on that first Christmas Day. Cadence couldn’t believe it; where did they go? Now all they could see were the cars on the street. Until he untied his laces and found straw in his shoe. Grandma kissed all the cheeks, Papa hugged like a bear. Made it feel like a home; a place you should be. The first gift of Christmas . . . He stopped by . . . He was here. God created everything. 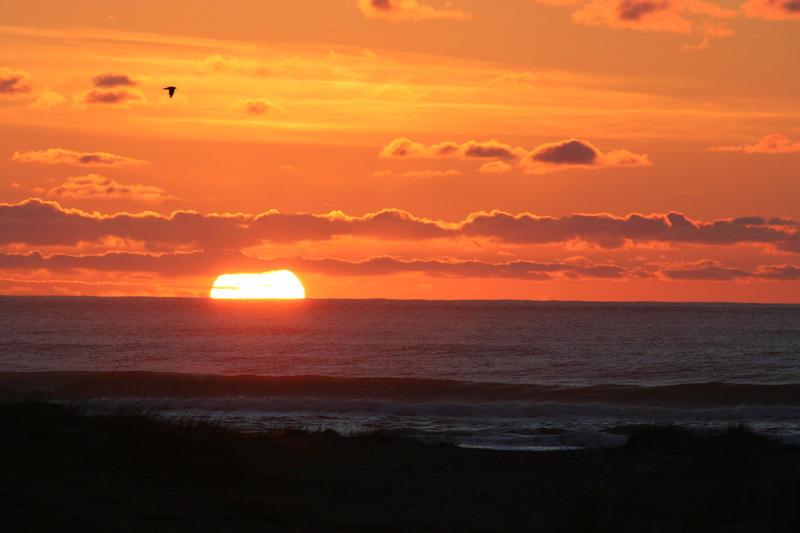 It just so happens that his most beautiful creation is the Oregon Coast line on the mighty Pacific Ocean. That is where I am blessed to live. Some might take offense at my biased assessment, but no matter where you live on this spinning orb of created matter, we are all touched with this reality: Seasons change. Whether we embrace it or not winter turns to spring, spring to summer, and in this season of autumn we are forced to acknowledge the full circle of change as winter waits in the wings to complete that circle. So it is with life—my life—and yours. A week ago my wife Karen and I attended our forty-five year high school reunion in Spokane. (We were high school sweethearts.) We had a great time connecting with classmates; some we had not seen since graduating. We all looked so different from our youthful splendor of 1968. A few weeks ago a buddy and I took a summer ride on our motorcycles down the coast to Pacific City, taking in all the awesome beauty and splendor, before the on slot of rain and wind that would soon consume the weeks and months to come. As some would welcome the calming beauty of November’s first snow, so I welcome the winter roar of the mighty Pacific Ocean. So what season of life are you in—have you welcomed it—have you embraced it? God determines the seasons, but we decide what we will do in it. This circle of seasons, like it or not, we will complete it. I am a husband, a father, a grandfather, a writer, an artist, and a dreamer. I love the season of life I am in. And as I draw closer to full circle, when all my seasons will have been fulfilled, my driving passion is to leave this world a better place than when I found it; and to hear my God say: “Well done my good and faithful servant. I would love to hear your story to understand your passion for life. So, what is the “Good Life”? That is a question only those brave enough to venture out on such a journey of discovery can answer. I am one of those brave souls, and my wife Karen decided to tag along with me on this crazy ride. It was 1999 and our favorite show on HGTV happened to be called “The Good Life”. It featured true stories of people deciding to walk away from the security of the life they knew to follow their dream. They were not actors but real people with stories of adventure fueled by passion. From a plumber to a painter with an art studio in Carmel, from a corporate exec to a tour guide in Alaska, from a teacher to a surf instructor in a cozy little seaside village, from a rural farm in Nebraska to a cabin in the mountains of Montana; each story so different, each dream unique, they were stories of conquered fear and fulfillment. One such story had Karen and me packing for a trip to Union, Oregon to experience the dream of one young couple who had placed all their hopes and resources into an old rundown hotel in the center of town. Our dream was different, but just as crazy. So why not?—they did it. October 2003, the twenty-seven foot U-Haul was packed and we were headed for Seaside, Oregon with the lights of Spokane, Washington fading in the distance. It must have been a crazy dream because all our friends and relatives told us so. Ten years later, here we are, more in love with the Oregon Coast than when we got here. From our house on the hill I look out at the magnificent beauty of the mighty Pacific Ocean, humbled by my God who not only provides for all our needs but often times serves us up a piece or two of “The Good Life”. From my room with a view I write these words and think of how blessed I am. Your dreams may be different. Pursue them. Life’s too short for regrets. What is your dream? It’s almost time for the OCW summer conference. I’m a little nervous but excited. I can’t wait to see what God has in store for me this year. This will be my third conference since my decision to jump right in the middle of this crazy world of writing. As Chip MacGregor has instructed and strongly suggests, I will be prepared for success. First impressions with all my scheduled appointments, I want them to be great ones. It has been a very busy summer, with work and writing and conference preparation. I am anxious to get my first completed manuscript, “The Darkside of Winter”, into print. It is suspense with a supernatural twist and very relevant in today’s ever changing political climate. I thought I might give you a tiny peak into the story to see what you think. I would appreciate feedback. Robert Fairmont is a preacher and he’s good at it. He’s happily married to Kathy, his wife of thirty years and is settled comfortably into his ordinary ‘no surprises’ life. He knows his place. Religion and politics don’t mix—you just don’t cross that imaginary line . . . unless you’re the Government. Then Kathy hears from God, in a dream—seven times—the same dream. She isn’t prone to having dreams; not like this one. And she is not alone. It wasn’t Bob’s dream, but he knew she was right. Why hadn’t God spoken to him? Maybe because he wasn’t listening. Bob likes his life, just the way it is. And he hates politics. But maybe it’s time . . . time to cross that imaginary line. Fast forward four years, eight months. Bob is on the run and under investigation for tax fraud, un-American activities, and is the only suspect in the untimely death of his wife Kathy . . .
July 4th 2013. It won’t be just another day . . . it never is . . . at the beach. Seaside starts to come alive with people around Memorial Day, but Independence Day is the official kickoff for summer. Families, food and fun—but best of all, memories. It started for Karen and me in the summer of 1999. The kids were grown; it was just the two of us. Karen’s birthday is on the 4th of July. Rumor had it that Seaside put on a pretty good fireworks show and besides it would be an excuse to come to the beach. So we did. Wow! The bunkers dug deep on the beach, the smoke from fireworks mixed with the smell of burning camp fires, the sun setting over the ocean with thousands of people dotting the shore line; it was like a war zone. 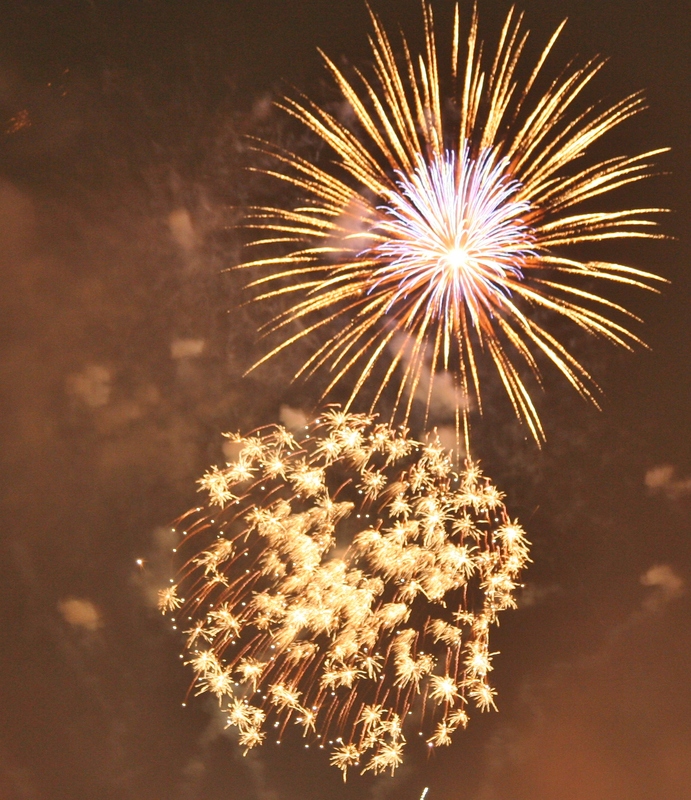 Our eyes burned and our ears rang with the non-stop explosions lighting up the summer sky. And that was just the pre-show. The official fireworks wouldn’t start for another hour and a half. We settled into our beach chairs; the show began. Music played and the sky lit up as we watched a thirty minute display of smoke and lights that would make any American proud. When it was over the roar of the mighty Pacific filled the night air. What was not to like? We had found a new tradition. Over the next four years we would make our pilgrimage, with family, to Seaside, Oregon on the 4th of July. Karen and I moved to Seaside in the summer of 2003. We now watch our favorite holiday celebration from the back porch of our house on the hill, with family and friends. So as we make memories to last a lifetime, in a place that fills us with imagination and a dream fulfilled, we think of freedom that isn’t free. Let us—each one of us—never forget, lest we lose the gift, bought with the ultimate price of blood and sacrifice. They starred back at me from the face of the stone cold black granite. Names, so many names. I closed my eyes to trace letters, one by one, with a trembling hand; letters etched deep, forming names; letters etched in memorial. Among the thousands there were six; six names, six faces scrolling through my mind like a photo album long forgotten. A dagger pricked my heart. They were dead; I was alive; war is hell. It was 1985 and the traveling Vietnam War Memorial had made its way to Worley, Idaho. I was a veteran who never had to face the horror of war, but I wanted to be there—no, I needed to be there—so Karen and I made the short trip from Spokane, Washington on a lazy Sunday afternoon. For the first time in my life, as I read their names, I understood the true cost of freedom. It was six guys amongst the list of thousands represented on those slabs of granite, all having paid the ultimate price for my freedom . . . and yours. I knew those guys; we graduated high school together. It has been forty years since Vietnam, and the killing fields are still strewn with those willing to buy our freedom with their lives. So on this Memorial Day weekend, with great humility, I will honor all our fallen heroes, past and present, and I will salute all of the men and women who today stand in harm’s way for the cause of freedom. I trust you will do the same.